The Saipan tourism industry is trying to attract more Filipino tourists by providing them with two new island attractions. Lead airline and tourism management company Avaiareps Philippines said the Marianas Visitors Authority (MVA) is offering the "Duck Tour" and "Sea Touch". The Duck Tour is an "amphibious-like" tour of the island using a vehicle that dates back to World War II. Here, tourists get to ride a dual-purpose vehicle which can stride in land and water. The vehicle was formerly a military equipment called the DUKW (pronounced as duck) that was used in rescuing injured soldiers during the invasion of Normandy. The tour starts at the Grapan Public Market and passes through the American Memorial Park and other historical destinations before splashing into Saipan's lagoon for 30 minutes. Meanwhile, the Sea Touch attraction in Saipan will allow tourists to interact and be up close with different marine species including sharks and stingrays in its sea aquarium. 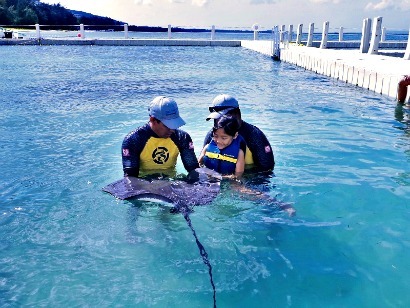 Sea Touch, located at the Fiesta Resort & Spa Saipan, is a government-backed project that aims to capitalize on the island's rich marine life. Aviareps Philippines Office Director Jean Lugan said that they have reported a steady growth in the number of Filipinos visiting Saipan. Lugan credits the increase in Filipinos traveling to Saipan to Philippine Airlines (PAL) providing direct weekly flights and the large Filipino community in the island. "More than the beaches and it being an adventure destination, Saipan is a home away from home as 36 percent of its population are Filipinos," Lugan said. “Working with MVA, we will make sure that there will always be new things for them to discover during their trips," the Aviareps director added.